Most days, by mid-afternoon, stepping outside of our air-conditioned villa on the Raytheon compound in Jeddah, Saudi Arabia, felt like stepping into a furnace. Sweat seeped from the pores even before one did anything. The sand, cement homes and asphalt roads acted like a magnet for the rays of the sun, which blazed overhead in a near-cloudless sky, and even a gentle breeze wasn’t so gentle – the lilting wind lifted grains of hot sand from the ground and pelted your skin with them. That’s my memory of what the weather was like during our initial days and weeks in Saudi, at any rate, but I was very young – all of 5 years of age – so I’m sure that what I recall is more impressionistic than not. 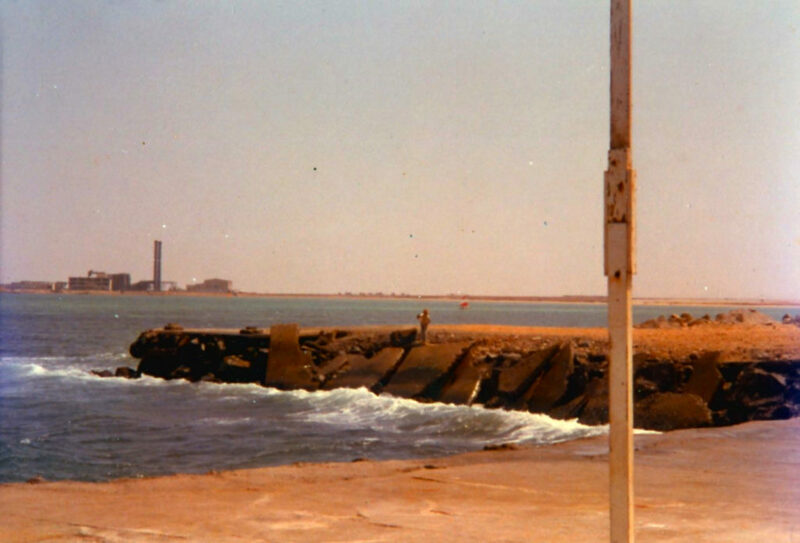 That said, we arrived in August 1970; Wikipedia states that the average (daytime) high in Jeddah for that month is 99 degrees and the average (nighttime) low is 80.8, with the following months easing up a tad. But, back then, all I knew was one thing: It was hot. As I inferred above, because of my age, a fair chunk of what I remember is a jumble. Some of what I recall is crystal clear, however, though many memories are missing three things: the day, month and year. That’s par for the course, I’ve read, for how the brain develops – time is an abstraction when one is young, and outside of birthdays and holidays, the days themselves matter less than the events contained therein. And, yes, that’s a roundabout introduction to a specific incident. Whether it occurred in 1970 or ’71, I can’t say. I just remember heading to the beach with my brother Ken, who’s a few years older than me. Perhaps our mother shooed us outside – we got rather rambunctious on occasion – or maybe we were simply being adventurous. Whatever the reason, we set out on what wasn’t a particularly hot day – though that part may be wrong. The sun shone overhead. If you read Part 1, you’ll remember that the compound was a walled community that sat on the Red Sea. (To borrow a line from The Wonder Years pilot, kids could wander the streets without fear of winding up on a milk carton.) Our home, House 14, was mere blocks from the beach, so it didn’t take long to get there. We strode with purpose across the coarse sand toward the jetty that jutted into the sea, or maybe our destination was simply the water’s edge to collect shells. Whichever, a dog barked, followed by another, and then another. In the distance, a cloud of sand kicked up and cleared, revealing a pack of barking dogs charging toward us. “Run!” Ken shouted, and we took off, the distance between the two of us expanding while the gap between me and the dogs shrunk. He made it to one of the beachfront villas, and climbed its patio wall to safety. Me? I glanced over my shoulder; there was no chance I was going to make it. I faced the thundering horde, raised my hand above my head and prepared for the worst. Within seconds, the lead dog slid to a stop at my feet, spraying my legs with sand – and raced away. The others chased after him, barking and yelping all the while. Salukis, greyhounds, other assorted breeds and mutts, a mix of wild and castoff canines – that was the makeup of the pack. Some were likely raised to race by well-off Saudis, then tossed aside, others may have been left behind by departing Raytheon personnel. And more than a few, like our future pet poodle Jacques would in a few years, simply left their people for a spell to be with their own. The call of the wild has pull. In retrospect, I doubt those dogs meant us harm. (I can’t imagine that I scared them.) Maybe they were out for a run, saw two kids alone on the beach and decided to have some fun. Perhaps they only wanted to play tag. At least, that’s what I’d like to think. I grew up on the Whittaker compound next door and always played and swam in the Raytheon pool. Great read your memories, I also had a fee close encounters with those dogs! I would love to hear more from you abiut the 70s , the timr I grew up there.